It’s a fact, all cats throw up hairballs from time to time, but there are methods to ensure a cat has fewer hairballs. Because cats groom themselves through licking their fur, the hair accumulates on their tongue, and is then often swallowed where it accumulates in their throat. Even larger cats like lions and tigers have this problem, and often find themselves throwing up their hairballs from time to time. To prevent hairballs, it’s important for cats to have a balanced diet. This includes kibble, as well as wet food. Consult a veterinarian for more precise information on what specific cats need to eat for nutritional purposes. Nutrition is a central part of maintaining overall cat health and wellness. There are also a few simple products that can help prevent hairballs. The same canned pumpkin pie mix used for pumpkin pie around Thanksgiving can help to prevent a cat from getting hairballs, in addition, most cats love it! 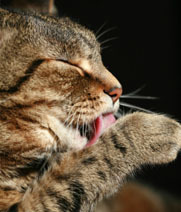 There are also special cat products like Petromalt which can help to prevent hairballs. Depending on the frequency of hairballs, some veterinarians recommend regular ingestion of Petromalt, while others will recommend once per month use.